BRUSSELS, Belgium, January 28, 2015 (ENS) – “Some people think that the recent decrease in oil prices will have a negative impact on electric cars. 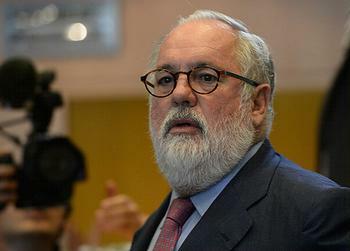 Personally, I am convinced that this will not be the case,” said Miguel Arias Cañete, EU commissioner for climate action and energy, in a speech at the IG Metall conference on Tuesday. The conference, titled, “Demands with regard to regulation of CO2 levels for the automotive industry,” was organized by IG Metall, the Industrial Union of Metalworkers. The dominant metalworkers’ union in Germany, it represents both blue-collar and white-collar workers in the automotive industry. “That is why, in the design of future regulation, we are taking a technology neutral approach. Manufacturers must be able to choose the most cost-effective ways to meet emission targets,” he told conference delegates. A member of the center-right Spanish political party Partido Popular, Arias served as Minister for Agriculture, Food and Environment in the Spanish Government from 2011 until 2014. He was a former director of two oil companies, Ducor SL and Petrologis Canarias SL, whose shares he reportedly sold just before his confirmation as climate and energy commissioner last fall. Opposed by environmentalists, who gathered half a million signatures on a petition against his confirmation, Cañete must also prove himself to the automotive workers union. In the dispute over emissions limits between the European Commission and the auto industry, IG Metall sees itself in a mediating role. “We want to move forward in climate policy, but we also want to ensure that employment is secured,” Detlef Wetzel, first president of IG Metall, said at the conference. Wetzel called for an impact assessment on the effects of structural change towards an electric drive on employment in the automotive industry. A revision of the carbon dioxide limit value is possible in this context in 2017 at the earliest, he said. Only then can it be seen how well electric cars will be accepted on the market and how much they can contribute towards CO2 reduction. “Currently, the demand for electric cars is significantly behind expectations. 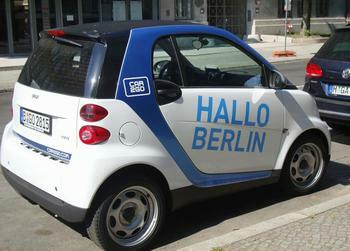 It is unclear when emobility will prevail,” Wetzel said. There are 14,000 registered electric vehicles in Germany, he said, yet the goals of CO2 reduction are only attainable for most car manufacturers by electric drives. “Therefore, the IG Metall demands effective incentives in favor of electric mobility in the regulation. Electric driving must be included in the calculation of the fleet averages as before with a CO2 emission level of zero grams,” Wetzel said. Last October, Arias reminded the IG Metall audience, EU leaders endorsed a new climate and energy policy framework for the period up to 2030. One of its cornerstones is a binding target to reduce EU greenhouse gas emissions by at least 40 percent compared to 1990 levels. This means that the transport sector has “to keep up – and step up – the pace of decarbonization. Europe needs to cut its emissions and reduce its dependency on imported gas and fuel, and transport needs to play its part,” said the commissioner. “That is why EU leaders mandated the Commission to look into measures and instruments we can use after 2020 to further reduce emissions, increase energy efficiency, and develop the use of electric transport and renewable energy in the transport sector,” he said. On February 25, the Commission will outline the strategic framework for the Energy Union. On the same day, the commissioners will adopt another communication on “The road to Paris” that will set out the EU vision and expectations in the run-up to the international climate negotiations in Paris in December,” he said. Later on this year, Arias said, the Commission will start to table legislative proposals to implement the EU’s climate and energy policy framework for 2030. But the success of CO2 legislation risks being undermined by the fact that the results measured in the laboratory do not correspond to what drivers are experiencing, the commissioner explained. So the Commission is working on developing a new worldwide harmonized CO2 test procedure, drafting legislation that Arias said will be ready early this year. “There is a clear commitment by the European Parliament, the Commission and Member States to go forward with this and have the new test cycle applicable from September 2017,” said Arias, asking the delegates for their support of the new CO2 test procedure. Finally, he said that while heavy-duty vehicles such as trucks, buses and coaches are responsible for about a quarter of all CO2 emissions from road transport in the EU, today these emissions are neither measured nor reported.